The Walmart car park we woke in reminded me very much of one that we stayed in last year and woke up to thunderstorms overhead. I know they are pretty much like for like, car parks, but to me they each have their own uniqueness. One may back onto a field or one might have a good selection of gardening stuff and plants outside. I love Walmarts! Anyway, it was quite coincidental because Tim woke up to lightening again in the distance, but this time it didn't amount to much and by the time I woke up it was very much like English drizzle. After a statutory granola yoghurt for breakfast, we drove to Amarillo and located a Verizon shop where we were hoping to purchase a replacement datacard which would provide us with internet after our original one was accidentally munched by my elbow the previous evening. After two painstakingly long hours in the shop we left with a new 4G wireless internet router and discovered the Storm Prediction Centre (SPC) had upgraded their risk of storms from 'see text' (the most minimal) to a 'slight' (pretty good and completely chaseable) directly overhead. 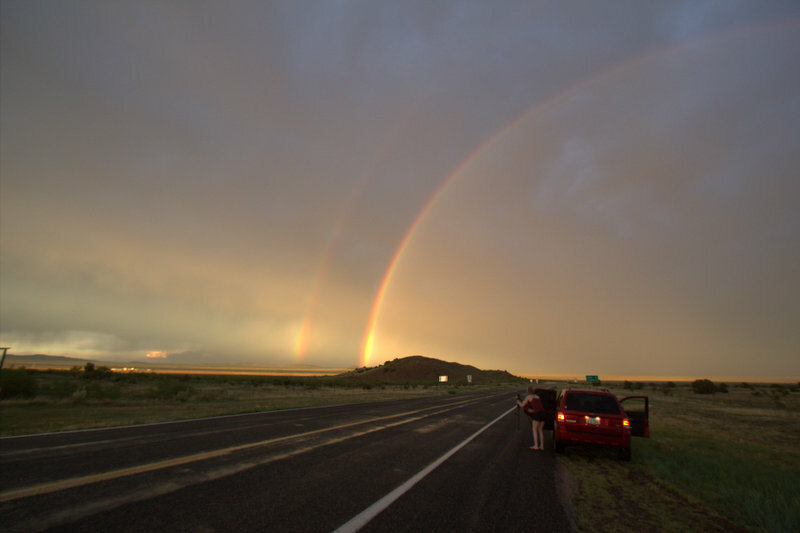 We were very happy and chose a target position to our west in New Mexico, a previously unentered state. I naively had the stereotypical impression that New Mexico would be a bright red desert with rocky outcrops like Marlboro country and full of Mexicans. Apart from the Mexicans, my thoughts were actually not far from the truth. It was a completely different backdrop to the flat grasslands of the plains and our usual chasing territory. It was beautiful and named by the New Mexicans themselves as 'the land of enchantment'. It looked typical of western films; craggy and red but with pretty little yellow and purple desert flowers and thistles with pink flowers. It was swelteringly hot too. We arrived at a place called Tucumcari, fuelled up and made a sandwich. The satellite data was showing a few little cells firing up to our North West. The problem was that the road network out this way was sparse. We had travelled in on the only main road in the area but to get to these firing storms meant taking a long and windy mountain road through the mountains in San Miguel county. We decided to do this and see what happened as we could always do a u-ey and come back the way we came if the storms looked out of reach. The road was awesome. It was solitary, windy and took us through all the amazing scenery. There were a few little towns on the way, although by town I mean 3 rundown looking outbuildings and a well kept church, a few wagons and a horse or 2. It was hard to understand how people survive in such remote places as these. Bridges were down in parts and detours took us off road. I kept thinking we may be held up by bandits, but we weren't. The storms themselves were about 100 miles away and not building particularly fast. The road eventually took us to a place called Springfield where one particular cell had also been travelling too. With Springfield in sight, we saw a few flashes of lightening and some good structure on the outer parts of the storm and by the time we actually arrived in Springfield itself the storm was in full swing. We stopped to get gas and had to leg it from the car into the gas station through driving rain and constant flashes of lightning and thunder rumbling through our feet. Hooray, our first storm. The storm was very accommodating and was began travelling parallel to the Interstate giving us the opportunity to track it as it went. As we drove right underneath it's overhanging outer edge we could look up and see the slowly rotating and pulsating lower parts of the storm. To the right the skies were dark and the rainshafts were clearly visible. We managed to park up and get a few shots of it but it was clear that this storm was at its peak and was not going to develop into anything more threatening. As it started to dissipate we drove on into the hills again get a view of the other storms in the area, which again seemed to be at their closing stages and got a few more piccies. We checked the radar data and it seemed that there was still one little storm cell in the area that appeared to have a core of half inch hail so we turned around again to find that, but it found us first and all of a sudden hail was ping-ponging off the car. We were surrounded in a white haze which could have been mistaken for mist, but was in fact hail. We had to slow down in an attempt to reduce the force of the hail hitting the windscreen. It was so much fun. It looked like this was to be the end of our chase day and we were left with a decision to either head north to better position ourselves for a potential risk the following day or track the back end of a line of storms that were further to our east and were the product of the earlier bunch of storms merging together to form a complex line, often referred to as a 'bow echo' due to their bowed appearance. It was getting dark by this point and we knew that from even 100 miles away the light show from such a system would be pretty special. So that's what we did, and as the sun set we had one of the most beautiful drives I've ever had over here. The route through the mountainous terrain of New Mexico had me nervously taking corners at probably under 10 miles/hr. I'm not so keen on heights and the shear drop to one side at certain points left me having to look directly at the road in front feeling and feeling a bit clammy! Then all of a sudden the pass we were driving along opened and we had a long descent with a sunset kissed view of the entire New Mexico plains in front of us. We stopped at the bottom to get a few shots. If this wasn't good enough our cake got fully smothered in icing when we suddenly were standing right under a full double rainbow. Oh yes, a double rainbow all the way to the ground. We don't know what it meant, but it was pretty stunning. After this we followed the storms for another hour or so and were treated to an electrical display that sent shivers down my spine quite literally. I got goosebumps at the sheer scale of the lightning which at times travelled from the furthest left hand part of the horizon right across the sky to the other side, whilst also being over us at the same time. It stole my breath on more than one occasion. 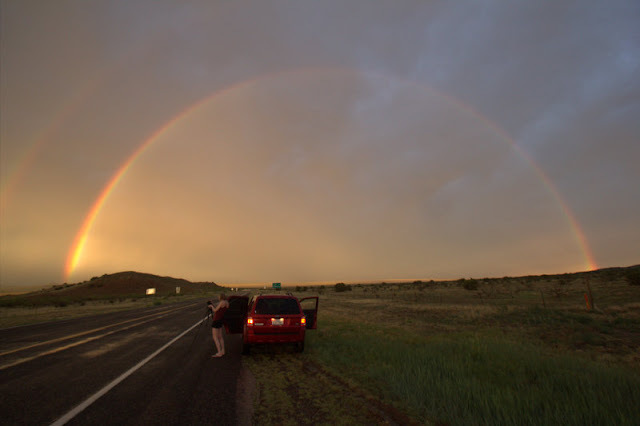 We then reached a more main road in Logan where we planned to change direction and head north to position for the next day and after a few hours more driving we reached Dalhart, a place in north west Texas where we found another bargain motel, some beer and a bed (which was much needed).